Animal Experience International- Animal Experience International is on a mission to help animals around the globe by matching clients with animal related volunteer opportunities at sanctuaries, hospitals, wildlife rehabilitation centres, conservation projects and government programs. 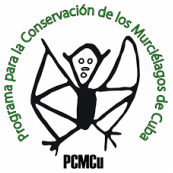 RELCOM- Seeks to halt the loss of species and populations of bats in Latin America, Cuba became part of RELCOM in 2004. Trinibats- There is still a vast amount of information to discover about the bats of Trinidad. Each year we organise expeditions to different areas in Trinidad to research the local bat fauna. These trips are aimed to train local and overseas people in bat identification and field skills whilst documenting the species and distribution in Trinidad. Merlin Tuttle Bat Conservation- Our mission is to teach people everywhere the many benefits of living harmoniously with bats. Fossil Matter by Joha Orihuela- Ramblings about paleontology, geology, archaeology, and history. Delta Optimist- January 2014 Sisters spend holiday in bat caves. La Joven Cuba- 22 de enero 2016 CUBABAT, el sueno de lo posible.